Hana Ice is right next to Tofuku-ji Temple. 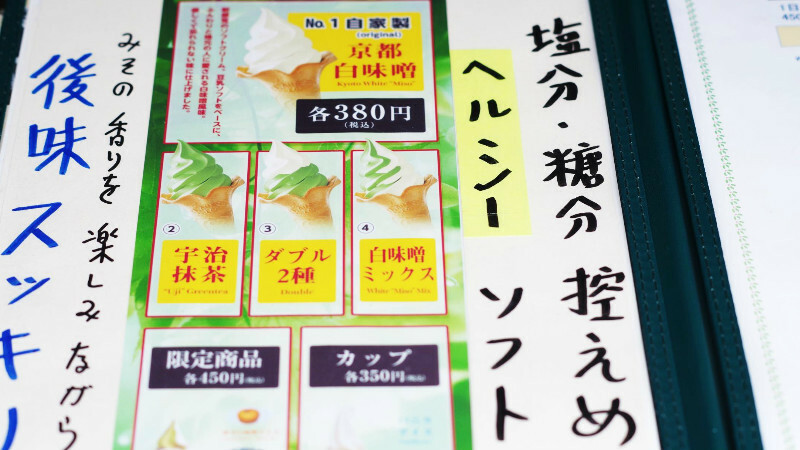 You can eat a not oft-seen flavor of soft serve here, white miso. Why does Hana Ice serve this rare flavor of soft serve? It’s because the shopkeeper, Mrs. Hana, was moved by the taste of white miso she tried in Kyoto. All the soft serve sold at Hana Ice is made by Mrs. Hana herself, and as you can probably guess, she takes her soft serve very seriously. Hana Ice is not only popular among tourists, but it’s also popular among the locals. This is because Mrs. Hana approaches each new customer like a new friend, and also because of her positive and affectionate personality. I wish that eating Mrs. Hana’s uncompromising soft serve will become an unforgettable memory of your trip to Kyoto. This, soymilk and Kyoto white miso soft serve, is the most popular menu item at Hana Ice. This soft serve is actually healthy; it’s low in both sugar and sodium content. The harmony of the sweetness of the soymilk and the slight saltiness of the Kyoto white miso make this soft serve really delicious! The ice cream cone also has a trick up its sleeve to make it go with the soft serve even better; it actually contains almond! In this product, Uji matcha soft serve is topped with white miso soft serve. The matcha soft serve uses matcha from Uji, so the taste of matcha is very rich. If you eat the miso and Uji matcha soft serve separately, you can enjoy the differences in their tastes. If you eat them together, you can enjoy a surprisingly great balance of tastes. Hana Ice contains a mix of Kyoto white miso and Uji matcha soft serve and even a warabimochi (jelly-like mochi made from bracken starch, covered in roasted soybean flour). You can choose the ice cream in the bottom from three options: yuzu-citrus white miso, black sesame white miso, and matcha-azuki bean. You can enjoy many tastes with this one cup of ice cream. Mrs. Hana made this Kyoto white miso pudding through trial-and-error so that even those with milk and egg allergies could enjoy something at the shop. On top, it has a mix of Uji matcha and Kyoto white miso soft serve. If you only want the pudding without the soft serve, the price of the pudding is 300 yen. I wish you will try Mrs. Hana’s handmade pudding! The menu has pictures and English on it, so ordering is easy. Everything at Hana Ice is handmade, so some of them are limited in numbers. Those who want to enjoy special menu items such as white miso pudding should go early! The icy desserts sold at Hana Ice are all delicious and healthy. All of them are made by Mrs. Hana herself. I wish you will try Kyoto white miso soft serve when you’re around Tofuku-ji Temple! 200 meters south from Tofuku-ji Station (a 3-minute walk). There are a few seats at the shop, so you can sit down to have your soft serve. The Japanese menu also has English on it.